The University of Pretoria has been lauded for the launch of its Future Africa research institute. The institute aims to address complex societal challenges and contribute to the achievement of Africa's sustainable, inclusive and equitable development through science, technology and innovation. 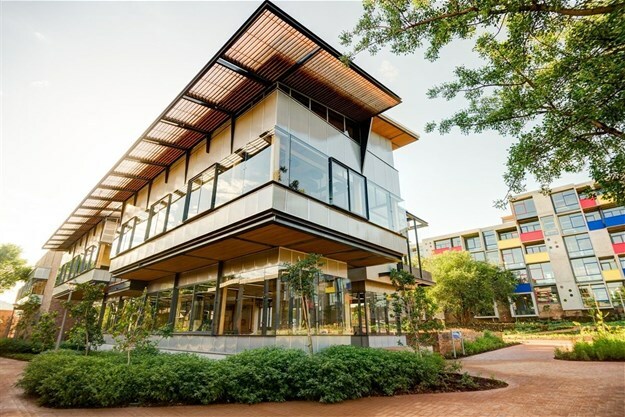 On-site features of the institute include modern living quarters for postgraduate students, accommodation for visitors, a dining hall, an open Research Commons designed for interactive work, and a state-of-the-art conference centre, as well as crop-based gardens. Addressing scientists, university staff and government officials, Minister of Science and Technology, Mmamoloko Kubayi-Ngubane said the institute “can stand as a shining example of how Africans can work to find solutions to Africa’s challenges by working together as Africans and not citizens of individual nation states". She said the Department of Science and Technology is in the process of establishing an African Centre for the Fourth Industrial Revolution in partnership with the World Economic Forum. "We are inviting other African countries, academics and the private sector to work with us to maximise the benefits of the Fourth Industrial Revolution. I ask this institute to become an active participant." The University of Pretoria's vice-chancellor and principal professor Tawana Kupe, who unveiled a plaque to commemorate the opening of the institute said: "Future Africa is a space to create new knowledge in new ways to address current and emerging complex, often seemingly intractable challenges that face primarily our continent, but also resonate globally. This means that we will find solutions to problems from a holistic viewpoint because problems rarely occur in a vacuum." He explained that a transdisciplinary approach to research is required, bringing together researchers and partners from many disciplines and various sectors of the broader community. Knowledge created through transdisciplinary, team-based research is a sound and good basis for evidence-based policy making, and monitoring and evaluation. This is necessary for Africa’s sustained and sustainable development. "Future Africa is becoming and will become an agent of change that will revolutionise knowledge creation in Africa and by Africans and their global collaborators to transform lives, sectors and industries, societies and nations; by making a contribution to the global archive of life-affirming knowledge," said Kupe. In line with the National Development Plan 2030, the African Union 2063 Strategy, and the Interim Post-2015 UN Strategic Development Goals, Future Africa’s research programmes will be based on areas which underpin its ethos and values, namely: sustainability and equity. Kupe said: "This transdisciplinary platform will focus on strengthening skills and knowledge in the areas of systems thinking, responsible leadership – including science leadership, examining the role of governance and institutions, and sustainable development that interrogates the requirements for future change." Future Africa will focus on promoting academic leadership by developing local and African science leaders, and boosting the number of researchers on the continent through leadership development programmes, postgraduate, postdoctoral and research fellowships, and hosting of visiting scholars. He said it is imperative that Africa’s youth are empowered, educated and enabled to find solutions to issues facing the continent, "because for such a young continent the future is theirs. Today we’ve made a commitment to give our young researchers from across the continent a platform in which to make a difference." For Kupe, many industrialised countries in the North use their resources and invest heavily in research and development. Some of the researchers who work in these countries are African scholars, researchers and specialists who do not find opportunities they need in Africa, and in doing so take much of Africa’s intellectual capital with them. Kupe urged researchers to "stay at home, in Africa, and help us build and rebuild our societies. At the University of Pretoria our call is a pan-African one, and we are making research opportunities available at Future Africa across the continent."